Thanks to everyone who sent in their ideas and subject matter. 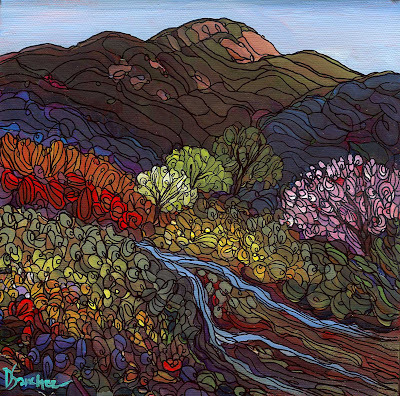 I had a hard time deciding but Linda sent me beautiful photos of these places and I just had to paint them. I give her first option on purchase, then it will go to you guys. I've never been to either of these places, but now I think I'm going to have to go! As for the rest of the ideas, I plan to complete each and every one of them, so stay tuned. And Leedy, don't forget, I will paint a horse for you. If anyone would like to see Linda's photos, I will post them. Have a great night! 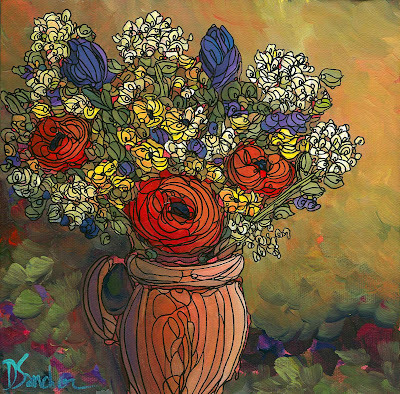 What can I say, I missed painting my flowers. 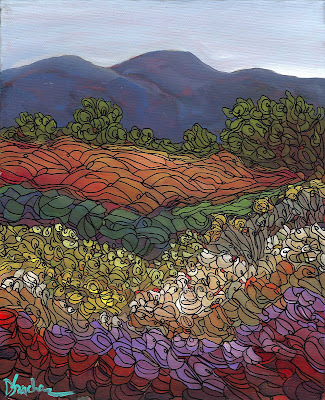 I had to have some stress relief and painting these fields always does it for me. They are colorful, yet peaceful. they are full of movement, yet to me, they have a certain stillness that is calming. 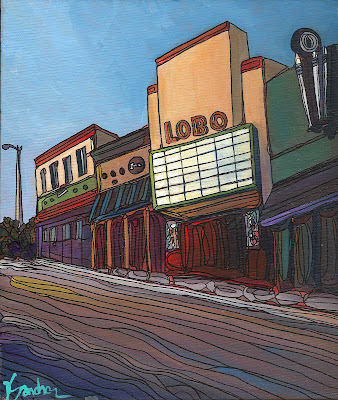 This is a painting of the old Lobo Theater near the University of New Mexico. It's not a theater anymore, I believe it's a church now. At least it's still standing. The last movie I saw there was, are you ready for this - "The Last Tango in Paris" with Marlon Brando. I think I was barely 17 and it was a very risque movie back then. Didn't think too much of it then, but I loved going to the theater. It had a balcony and was one of those beautiful old-time movie houses, with velvet ropes and fancy carpet. I don't normally paint buildings and I don't draw things to scale so it has a whimsical look that I like. Please email me for purchase information. 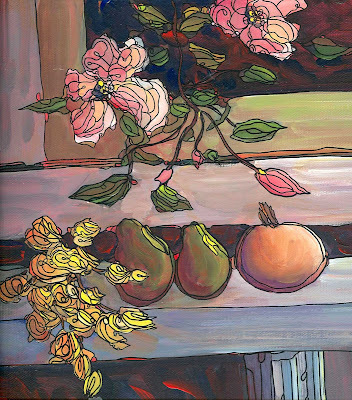 A little larger than my usual daily paintings - this painting has so many things that remind me of the good old days; old climbing roses, vegetables from the garden, fall leaves, an old barn wood bench and an old window. We used to live next door to my grandmother and this painting brings back a lot of good memories. Hope you enjoy! 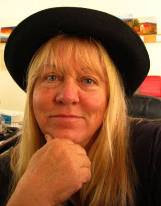 On another note, I have joined a new group: Rainbow Artists; a women's collective in New Mexico. They have about 100 members and have all kinds of cool exhibitions everywhere. Check them out at http://www.rainbowartists.com/ Today I am going all over town to look at urban street scenes for an upcoming exhibitions. I'm excited already! 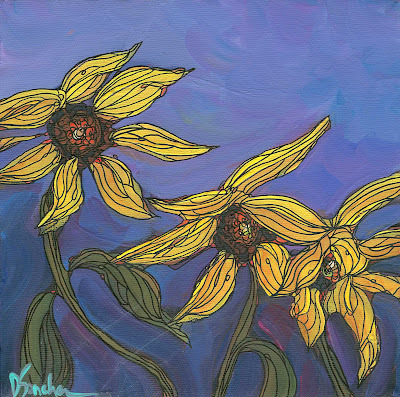 I haven't painted a blue background for awhile and I decided to paint these black-eyed susans. To me, they seem to be swaying in the wind. I added a little orange in the centers to contrast with the blue and I don't know if you can tell, but there are layers of purple in the blue to contrast with the yellow. Hope you enjoy - these make me happy. I want to go buy seed packets! 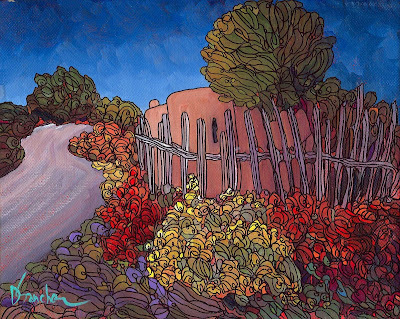 the Plein Air Society of NM, and I think this was Day 2. I was parked up on a high ridge looking down over this valley. The view was incredible and I love the trees peeking up between the ridges. The feeling that morning was so nice, clouds everywhere with little patches of sunlight. Well, I told you I might paint it one day, and I did! I streamlined it and just got in the basics, without a lot of details. 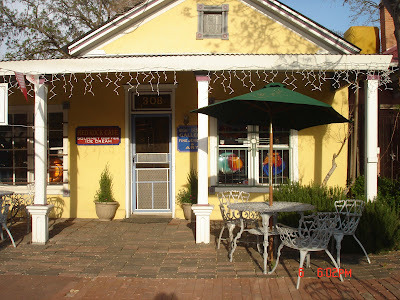 and how the sunlight seemed to give the yellow of the cafe a warm glow. 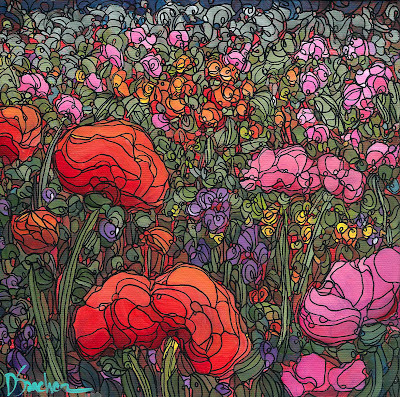 I think this painting would look really nice in an antique gold frame. Guess what? This is not a painting! 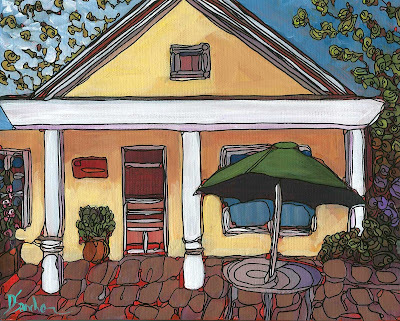 I didn't have time for a daily painting today so I am posting a pic of a cute little cafe in Old Town, which is in the center of Albuquerque and in a historical district. There are tons of galleries, a big parklike area with gazebo, one of the oldest churches in NM, and lots of cute little shops and places to eat. Julia's green chile, yum! They have huge weddings there, mariachi concerts, you name it. 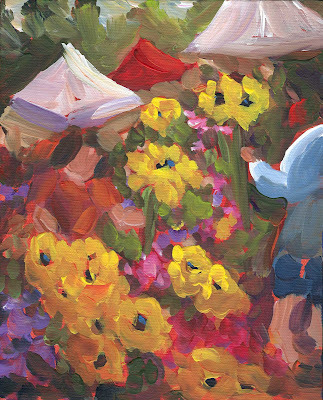 I do painting demos in front of Weems Gallery during the spring and summer or when I have a show there. Maybe I will paint this little cafe for you one day! 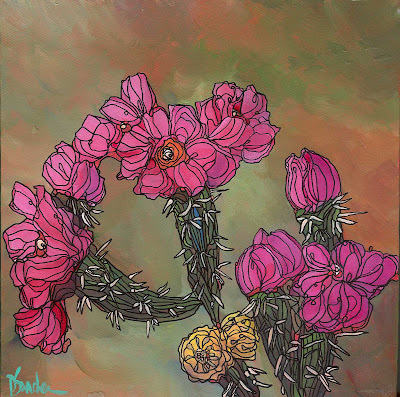 I haven't painted cholla cactus for a long long time. it's a wild explosion of color. on five acres of my land up in the mountains east of Albuquerque. and I could not wait until these guys bloomed. The rest of the time they were the prickliest things alive. 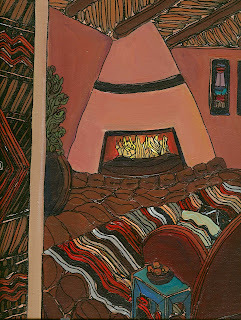 It's so cold in New Mexico right now that I wanted to paint something with a warm feel to it. 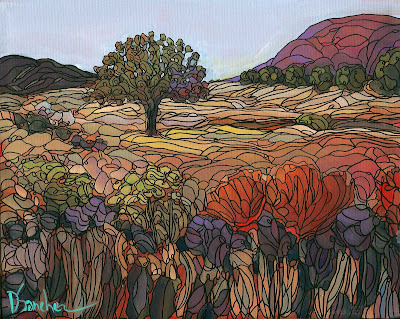 I want to be sitting in that little spot of warm orange beneath the pinon trees! 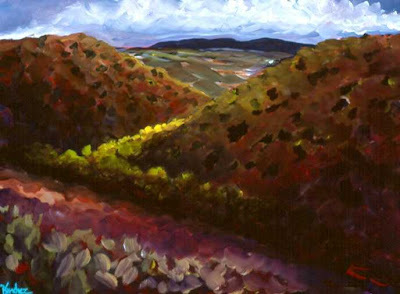 This is taken from a photo I took while on a plein air paintout in Placitas. If you've never been to Placitas, it's pretty cool. It's a little north of the Sandia Mountains, I'm not sure if it's part of that mountain or not. It's just a quaint little village. 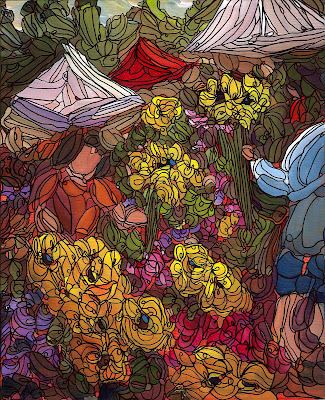 In fact, they have an incredible art fair there every year. Check it out online. I love painting these square canvases. There's something so "zen" about them, perfectly balanced. Tonight's painting is similar to a piece I just finished for my brother. I liked his so much that I decided to create a smaller piece to post on the blog. 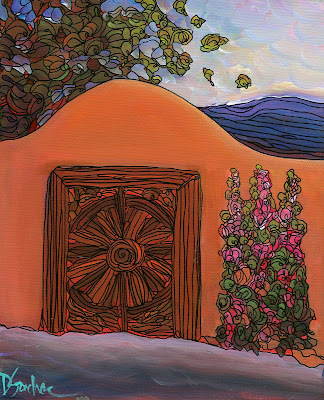 This image is from Blueberry Hill in Taos near the Rio Grande Gorge. We stayed at a house near here and I snapped this photo while taking a walk. The yellow foliage is fall chamisa. I don't know what the orange-red bushes are but they were vivid and beautiful. The purples in the foreground- oh, that's just me. Almost dusk, the last light of day is hitting the trees and the little adobe outbuildings. I envision this as someone's land and this little orchard is a ways from the main house. There is also a growing field, possibly lavender (my dream crop!). I just can't decide which one I like better! The purchase information applies to the finished lined version. 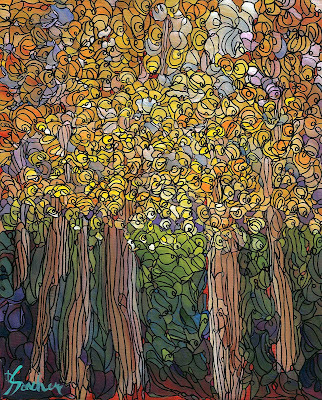 This painting started out as one thing and became something totally different. 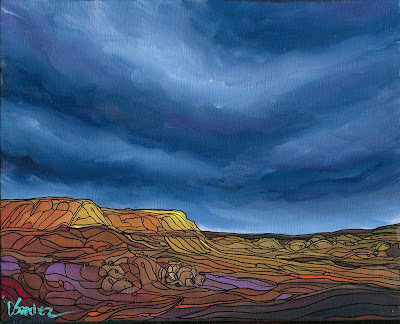 The sky was supposed to have a lot of white clouds but the orange-red underpainting dictated the blues and purples. 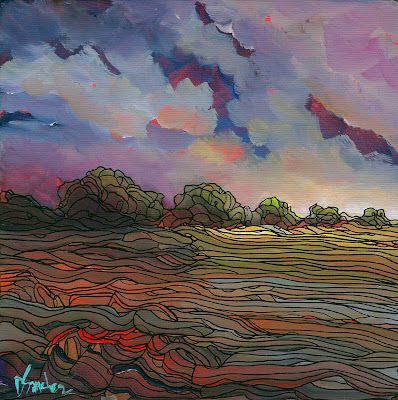 It reminds me of a New Mexico sky after a rainstorm and I love that last little light sneaking across the fields. This mountain is in Taos, New Mexico. our relative's property in Arroyo Seco. The water is not a running stream but when my brother-in-law opens the gate, this water flows from the acequia and waters his property. Acequias are a really old system of irrigating fields and land in New Mexico. Families have farmed this way for centuries, I believe. I actually have an acequia right next to my house and we use it to water our land. This painting is a smaller version of a commission I created in July. If you cruise back on my blog, you can see the larger version. I haven't painted on any square canvases for awhile and I realize I am missing them. There's a zen quality to painting on a surface that is perfectly square. 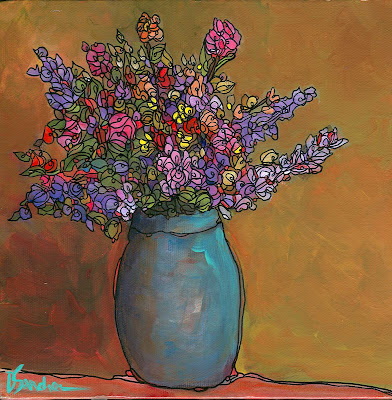 I hope you like this little still life bouquet. 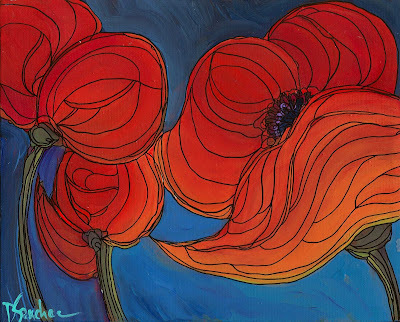 I love poppies in all colors and varieties. like they were swaying in the wind. I think they're a nice contrast against the blue. with the sky peeking through. Hope you like it. and I am almost done, so hopefully I will post that tomorrow. Things are going well, I'm getting ready to plan for my Weems April show - what to do? 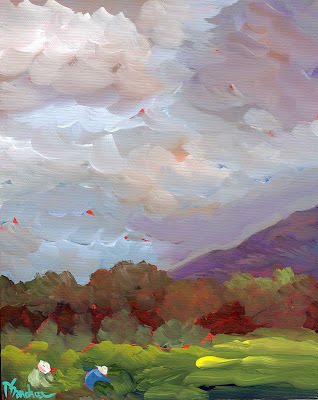 I am thinking about painting a bunch of small framed oils for something different this year. 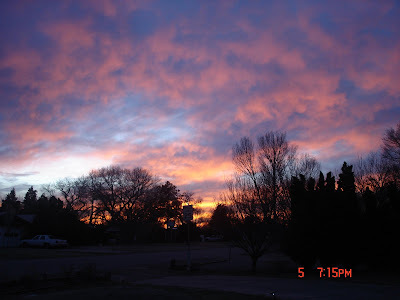 I'm also trying to decide if I want to do the New Mexico Arts and Crafts Fair that happens in June. So many things, so little time. 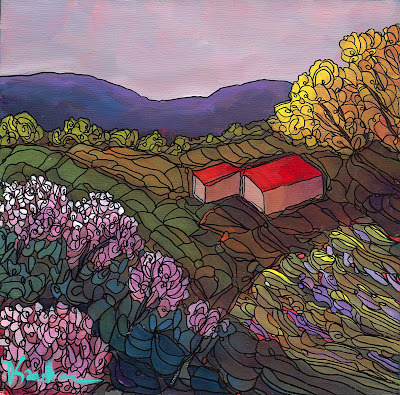 There's also a plein air paint out at the Bosque del Apache Wildlife Refuge this month. I wanna do that too!! As you can see, this is a work in progress. I had intentions of finishing it by this evening, but life intervened. interspersed with purple, orange, and red. 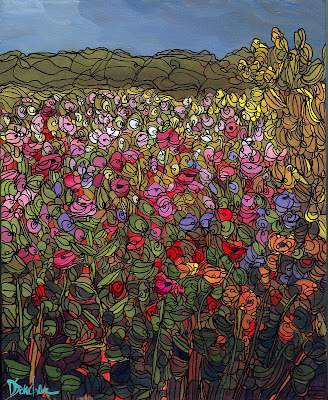 It was fun to paint - I kind of wish it was a 50"x50". That may be a goal for this spring! and you can see the outline work in progress. I will be posting this painting tonight. I will show it in full as soon as my camera batteries are charged! and also colors that are not a normal part of my palette. 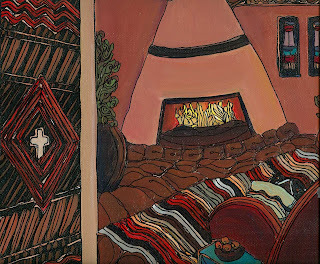 It's an interior shot from Santa Fe. I LOVE this painting. I was driving in the village of Corrales one day and these workers were harvesting green chile against the backdrop of the Sandia Mountains. The clouds were moody and beautiful. You know, you paint every day, things turn out okay, and sometimes you get one that just makes your day. This one has made my week in terms of what I wish to accomplish with my work. 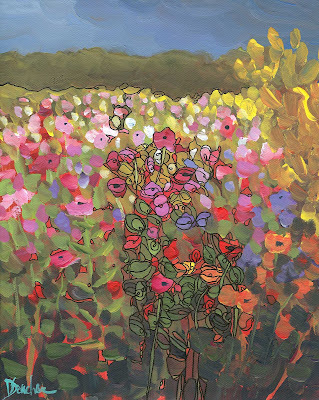 Tomorrow I will post the photo from which the painting originated. 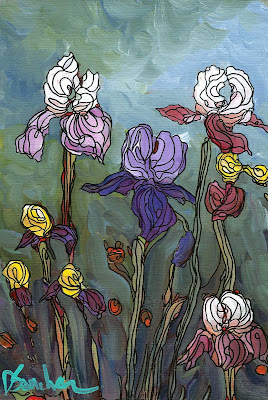 This painting is a tribute to all of the women in my family who loved and grew irises when I was little. My grandmothers, my mom, my aunts - I can remember hiding in big beds of iris at all of their houses when we played and the smell was incredible. What a sturdy yet graceful flower. Tomorrow starts another year of daily painting! I can't believe a whole year has come and gone already. I completed 122 daily paintings. Whew! lots of donations to charity, including a fiberglass balloon for the Albuquerque International Balloon Fiesta, my annual hope chest for Casa Esperanza, the Animal Humane Association, Double Eagle elementary school art program, Legacy Art (Amado Pena's annual fundraising scholarship event), Weems Artfest, the Lobo Howl, Chocolate Fantasy Ball, the Domestic Advocacy Center, The Day of the Tread, those are the ones I recall right now. I wish you all the best, thanks for watching my blogsite, thanks for bidding and purchasing, this all inspires and supports me so much, you'll never know!